Fr. Donald Nesti, CSSp, is on the ISH Board of Trustees, and beloved in the community for his tremendous wisdom, warmth, and spirit. We thank Fr. Nesti for sharing his insight around the meaning of this special Jubilee year, with Pope Francis’ focus on mercy, “to find newness of life, love and joy.” Fr. Nesti is the Director of the Center for Faith & Culture at the University of St. Thomas in Houston. The greatest challenge facing us in this millennium is what St. John Paul II called “the spirituality of communion.” To live that spirituality means that we look upon every person as a gift for us and see ourselves as a gift for them. Neither we nor they are complete without each other’s gift. To live this spirituality is to live a life of mercy, to love the other even when we do not think that they merit that love. The God of Mercy “causes his sun to rise on the bad as well as the good, and sends down rain to fall on the upright and the wicked alike.” (Gospel according to Matthew 5:45) So, too, must we if we are to create a civilization of love. 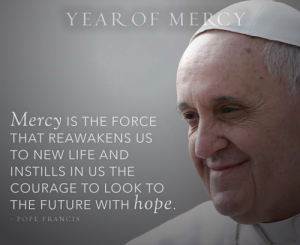 Mercy, too, is the longing at the heart of all world religions. It is the foundation of one human culture. It is the invitation to learn to live in a school of self-transcending love which seeks the common good in common. It is the opposite of any form of narcissism. Mercy, therefore, holds before us the vision of the possibility of the unity of all human kind. Mercy’s face is Hope.